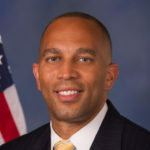 Democratic Congressman Hakeem Jeffries is perhaps best known for the fiery speech he gave last month while nominating Nancy Pelosi as Speaker of the House, ad he’s most recently known for ripping Acting Attorney General Matt Whitaker a new one during his recent congressional testimony. Now Jeffries is setting his sights on a new target: Donald Trump. Hakeem Jeffries was just getting started. He went on to rip Donald Trump for wanting a to build a “medieval border wall.” Jeffries delivered his answer to Trump, appropriately enough, in Russian: “NYET!” He also added that “We’re just getting started” when it comes to dismantling Trump.